The minerals that make up igneous rocks crystallize at a range of different temperatures. This explains why a cooling magma can have some crystals within it and yet remain predominantly liquid. 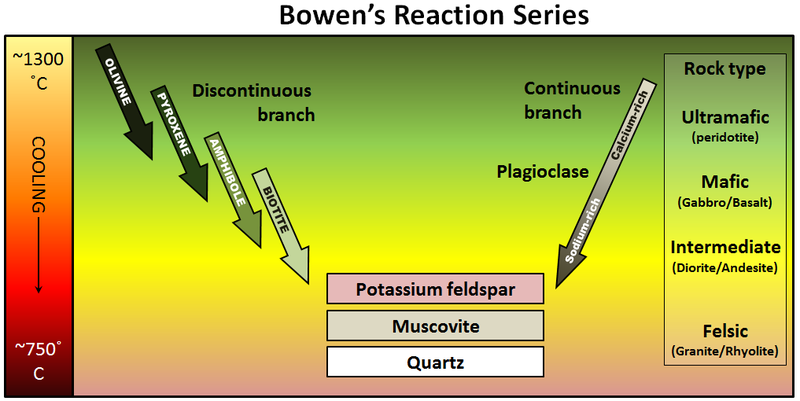 The sequence in which minerals crystallize from a magma is known as the Bowen reaction series (Figure 3.10 and Who was Bowen). Of the common silicate minerals, olivine normally crystallizes first, at between 1200° and 1300°C. As the temperature drops, and assuming that some silica remains in the magma, the olivine crystals react (combine) with some of the silica in the magma (see Box 3.1) to form pyroxene. 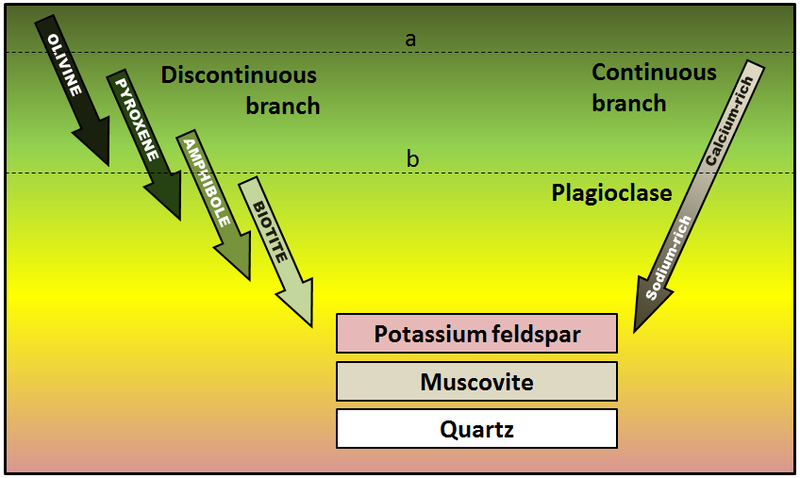 As long as there is silica remaining and the rate of cooling is slow, this process continues down the discontinuous branch: olivine to pyroxene, pyroxene to amphibole, and (under the right conditions) amphibole to biotite. At about the point where pyroxene begins to crystallize, plagioclase feldspar also begins to crystallize. At that temperature, the plagioclase is calcium-rich (anorthite) (see Figure 2.15). 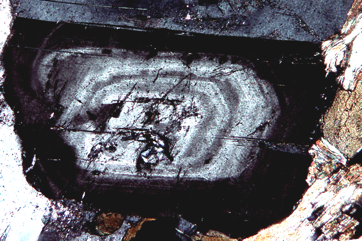 As the temperature drops, and providing that there is sodium left in the magma, the plagioclase that forms is a more sodium-rich variety. 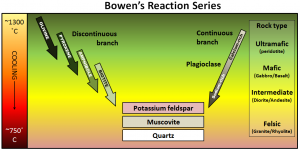 Who was Bowen, and what’s a reaction series? 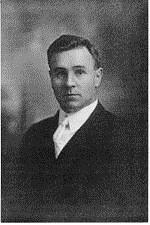 Norman Levi Bowen, born in Kingston Ontario, studied geology at Queen’s University and then at MIT in Boston. In 1912, he joined the Carnegie Institution in Washington, D.C., where he carried out groundbreaking experimental research into the processes of cooling magmas. Working mostly with basaltic magmas, he determined the order of crystallization of minerals as the temperature drops. The method, in brief, was to melt the rock to a magma in a specially made kiln, allow it to cool slowly to a specific temperature (allowing some minerals to form), and then quench it (cool it quickly) so that no new minerals form (only glass). The results were studied under the microscope and by chemical analysis. This was done over and over, each time allowing the magma to cool to a lower temperature before quenching. In cases where cooling happens relatively quickly, individual plagioclase crystals can be zoned from calcium-rich in the centre to more sodium-rich around the outside. This occurs when calcium-rich early-forming plagioclase crystals become coated with progressively more sodium-rich plagioclase as the magma cools. Figure 3.11 shows a zoned plagioclase under a microscope. Finally, if the magma is quite silica-rich to begin with, there will still be some left at around 750° to 800°C, and from this last magma, potassium feldspar, quartz, and maybe muscovite mica will form. The composition of the original magma is critical to magma crystallization because it determines how far the reaction process can continue before all of the silica is used up. 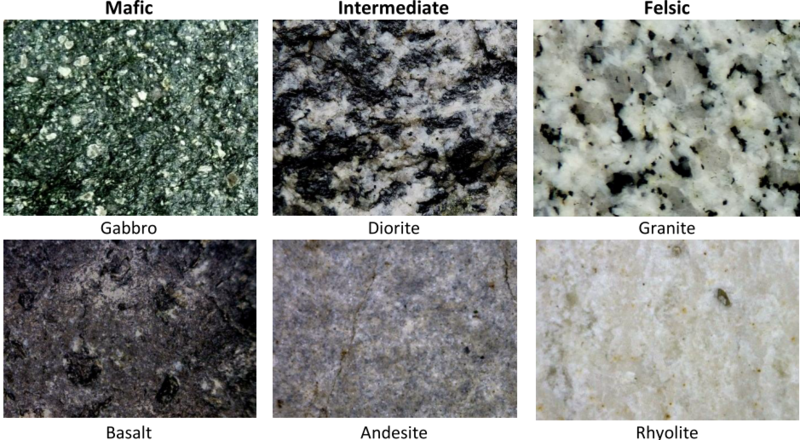 The compositions of typical mafic, intermediate, and felsic magmas are shown in Figure 3.12. Note that, unlike Figure 3.6, these compositions are expressed in terms of “oxides” (e.g., Al2O3 rather than just Al). There are two reasons for this: one is that in the early analytical procedures, the results were always expressed that way, and the other is that all of these elements combine readily with oxygen to form oxides. Mafic magmas have 45% to 55% SiO2, about 25% total of FeO and MgO plus CaO, and about 5% Na2O + K2O. 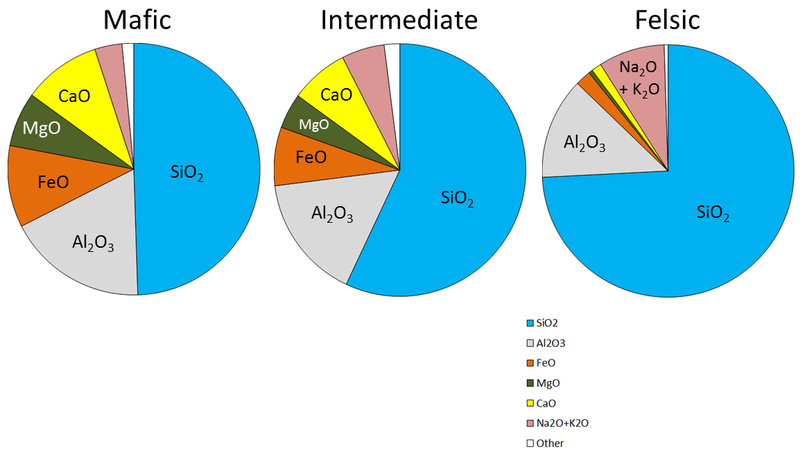 Felsic magmas, on the other hand, have much more SiO2 (65% to 75%) and Na2O + K2O (around 10%) and much less FeO and MgO plus CaO (about 5%). Chemical data for four rock samples are shown in the following table. 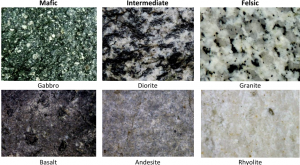 Compare these with those in the table above to determine whether each of these samples is felsic, intermediate, or mafic. SiO2 Al2O3 FeO CaO MgO Na2O K2O Type? As a mafic magma starts to cool, some of the silica combines with iron and magnesium to make olivine. 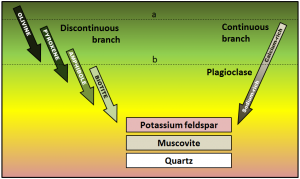 As it cools further, much of the remaining silica goes into calcium-rich plagioclase, and any silica left may be used to convert some of the olivine to pyroxene. Soon after that, all of the magma is used up and no further changes takes place. The minerals present will be olivine, pyroxene, and calcium-rich plagioclase. If the magma cools slowly underground, the product will be gabbro; if it cools quickly at the surface, the product will be basalt (Figure 3.13). Felsic magmas tend to be cooler than mafic magmas when crystallization begins (because they don’t have to be as hot to remain liquid), and so they may start out crystallizing pyroxene (not olivine) and plagioclase. As cooling continues, the various reactions on the discontinuous branch will proceed because silica is abundant, the plagioclase will become increasingly sodium-rich, and eventually potassium feldspar and quartz will form. Commonly even very felsic rocks will not have biotite or muscovite because they may not have enough aluminum or enough hydrogen to make the OH complexes that are necessary for mica minerals. Typical felsic rocks are granite and rhyolite (Figure 3.13). The cooling behaviour of intermediate magmas lie somewhere between those of mafic and felsic magmas. Typical intermediate rocks are diorite and andesite (Figure 3.13). A number of processes that take place within a magma chamber can affect the types of rocks produced in the end. 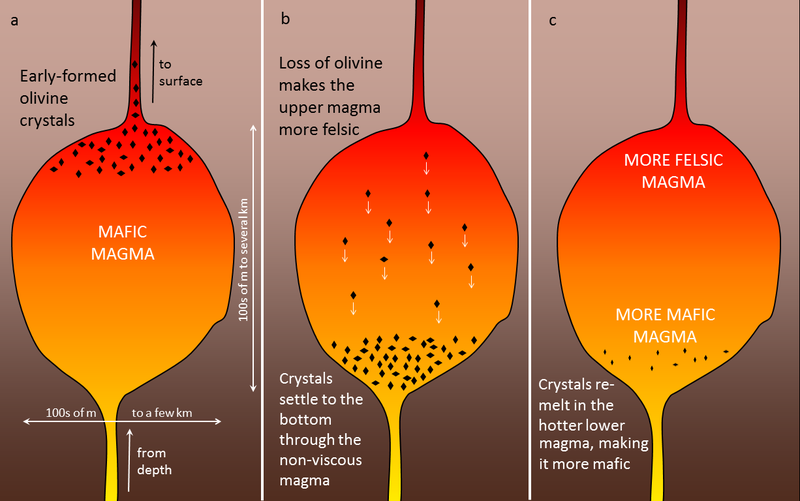 If the magma has a low viscosity (i.e., it’s runny) — which is likely if it is mafic — the crystals that form early, such as olivine (Figure 3.14a), may slowly settle toward the bottom of the magma chamber (Figure 3.14b). The means that the overall composition of the magma near the top of the magma chamber will become more felsic, as it is losing some iron- and magnesium-rich components. This process is known as fractional crystallization. 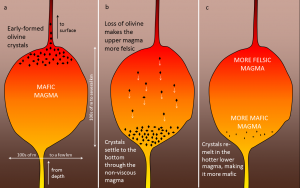 The crystals that settle might either form an olivine-rich layer near the bottom of the magma chamber, or they might remelt because the lower part is likely to be hotter than the upper part (remember, from Chapter 1, that temperatures increase steadily with depth in Earth because of the geothermal gradient). If any melting takes place, crystal settling will make the magma at the bottom of the chamber more mafic than it was to begin with (Figure 3.14c). If crystal settling does not take place, because the magma is too viscous, then the process of cooling will continue as predicted by the Bowen reaction series. In some cases, however, partially cooled but still liquid magma, with crystals in it, will either move farther up into a cooler part of the crust, or all the way to the surface during a volcanic eruption. In either of these situations, the magma that has moved toward the surface is likely to cool much faster than it did within the magma chamber, and the rest of the rock will have a finer crystalline texture. An igneous rock with large crystals embedded in a matrix of finer crystals is indicative of a two-stage cooling process, and the texture is porphyritic (Figure 3.15). As a magma cools below 1300°C, minerals start to crystallize within it. If that magma is then involved in a volcanic eruption, the rest of the liquid will cool quickly to form a porphyritic texture. The rock will have some relatively large crystals (phenocrysts) of the minerals that crystallized early, and the rest will be very fine grained or even glassy. Using the diagram shown here, predict what phenocrysts might be present where the magma cooled as far as line a in one case, and line b in another. 3.3 Crystallization of Magma by Steven Earle is licensed under a Creative Commons Attribution 4.0 International License, except where otherwise noted.